Search for Grace Darling in CBW. Find Grace Darling on the Pop Chart. At the dawn of the Victorian Era, one diminutive but brave young woman captivated the national consciousness as a result of her role in a dangerous rescue mission off the coast of Northumberland. Her name was Grace Darling, and through her efforts in the rescue of nine shipwrecked passengers early on the morning of September 7, 1838, she was transformed into an exalted national hero. She was both lauded and hounded by the public up until her early death, after which she, and her story, continued to entrance the public imagination in Britain and abroad. Grace Horsley Darling was born in Bamburgh, Northumberland on November 14, 1815, and was the seventh of William and Thomasin Darling’s nine children. William Darling was a lighthouse keeper, as his father had been before him, and Grace and her siblings grew up on the “Longstone Light on one of the wild and savage Farne islands” (Sitwell 59). Relatively little is known regarding Grace’s early years, though she seems to have received a solid education evident in her handwriting, which was “equal to that of most ladies” (Bruce 376). Furthermore, she was surrounded by books, albeit those “principally [of] Divinity” and “Geography, History, Voyages and Travels, with Maps” (Mitford 89). Her father regarded novels and other forms of literature, as well as pursuits such as card-playing, to be the works of the Devil, and raised his family within the confines of strict Puritanism (Mitford 89; ODNB ). In their remote location, Grace and her family were isolated from society at large, making only occasional excursions to the mainland, and otherwise occupying themselves with the daily domestic duties of the lighthouse (Bruce). Perhaps as a result of this confined but (for Grace, apparently) enjoyable upbringing, Grace was “remarkable for a retiring and somewhat reserved disposition” (Bruce 376). She assisted her father in his work on the lighthouse and kept watch at times (ODNB), bearing witness to several wrecks and rescues over the course of her lifetime but never participating in them, as her older brothers were always present to help their father (Bruce). In this manner, for the first twenty-two years of her life, the mild-tempered “young girl of five feet two, with small wrists” (Sitwell 61) lived quietly in a household of sober industry and religious commitment. The events of the early hours of September 7, 1838, however, drastically expanded the confined world in which Grace lived, though they never seemed to change her fundamental personality and temperament. The Forfarshire, one of the largest steamships of its day, set off from port on September 6, 1838, carrying around sixty people, crew and passengers. Upon encountering a brutal storm near the Farne Islands, the ship was wrecked on Big Harcar Rock (Mitford 29). 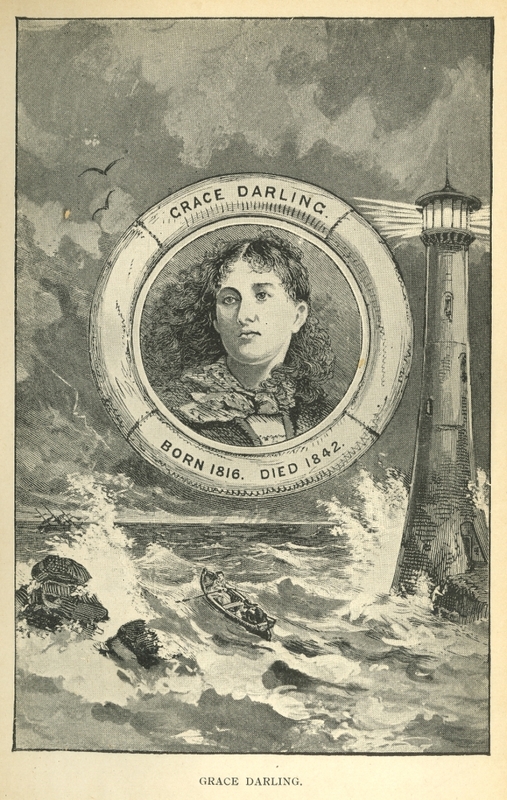 Grace, keeping watch from the lighthouse, glimpsed the nine survivors at around five o’clock on the morning of September 7 and informed her father (Thomasin Darling). Her older brothers had all left their parents by then to live on the mainland, while her younger brother, who was usually present at the lighthouse, was away on a fishing excursion (Mitford 29). As a result, Grace was put in the unusual position of being the only able-bodied assistant for her father. Most initial accounts of the story of this day portray William Darling as reluctant and unwilling to brave the stormy waters, while Grace forced him into action by declaring her intention to go regardless of his participation (Sitwell). Later accounts, however, have questioned this depiction of the story, and the only firsthand written account of the rescue is that of William Darling himself, in the official letter he wrote to the Secretary of Trinity House. His depiction of the rescue is a straightforward factual representation in which he credits his “Daughter” with having “observed a vessel on Harker’s Rock” and “incessantly [applying] the glass until near 7 o’clock when, the tide being fallen [they] observed three or four men upon the rock.” He then states that they “agreed that if [they] could get to them some of them would be able to assist [them] back,” after which they “immediately launched [their] boat, and [were] enabled to gain the rock.” Grace and William then returned to the Lighthouse with the sole woman and four of the men, two of whom then returned with William to retrieve the remaining four men (William Darling). The matter-of-fact attitude with which these events were treated by the Darling family is evident in William Darling’s account of the rescue. To a family of lighthouse-keepers, dangerous rescues were fairly frequent occurrences, and the efforts that Grace and her father put forth were expected and unremarkable. Indeed, William Darling is likely to have thought of the prospect of "sole salvage rights" to the goods in the wreck if he could reach the ship (ODNB). The rest of the nation, however, did not perceive the event in such a pragmatic manner. Instead, the public exalted the romantic and heroic nature of the event in a manner directly opposed to the down-to-earth humility of the Darlings’ reaction. The year 1838, one year following the beginning of Queen Victoria’s reign and its corresponding era, was a “moment [that] was opportune for acclaiming female virtue” (Correspondent). Although Grace and her father played equally significant roles in the rescue of the survivors, it was Grace and the combination of her unconventional physical feat and virtuous humility, emblematic of ideal Victorian womanhood, that attracted the media and publicity. The number of visitors at the Longstone Lighthouse increased exponentially as people from all over the country flocked to meet the great heroine and see the location of her selfless deed. In addition to the masses that besieged the once reclusive world of Longstone Lighthouse, numerous institutions celebrated the Darling family. The Royal Humane Society acknowledged Grace and William Darling in a special general court held on October 31, 1838 that highlighted the “intrepidity, presence of mind, and humanity that nobly urged [Grace]” to rescue the survivors of the shipwreck (Thomasin Darling 26). In addition to this acknowledgment, Grace and William each received the society’s Golden Medallion, one of the highest honors of that time. The Duke of Northumberland was chosen to deliver the honorific medallions, and he added to the delivery his own gifts for the family: waterproof clothing, a silver teapot, a gold seal engraved with Grace’s initials, and four pounds of tea. It was through this act of largesse that the lifelong friendship between the Duke and Grace began (Thomasin Darling). Following the Royal Humane Society’s lead, many other national and local institutions recognized Grace’s actions. She received medals from The Royal Institution for the Preservation of Life from Shipwreck, The Edinburgh and Leith Humane Society, The Glasgow Humane Society, and The Shipwreck Society of Newcastle. Some organizations, such as Lloyds, the insurance company, and The Ladies of Edinburgh, chose to send money and stocks to Grace and her father. Just a year after the shipwreck, Grace had received about seven hundred and fifty pounds' worth of stock (Thomasin Darling). Medals, stocks, and money were not the only gifts that Grace and her family received. Admirers sent a plethora of treasures that included silver tea sets, jewelry, and even a beaver bonnet. The number of presents received by the family, despite its immensity, was insignificant in comparison to the number of letters sent to the lighthouse. Many people wrote simply to praise Grace, demonstrating the public fascination surrounding her. Others wrote to describe how they had lost loved ones in shipwrecks and to thank Grace for preventing others from suffering the same loss. Queen Victoria herself recognized and contributed to Grace’s national prominence when the Darlings received a letter from the United Kingdom’s Treasury stating that “Her Majesty [had] been called to the circumstances attending the Wreck of the Forfarshire Steamer” and wished to acknowledge Grace Darling for her actions in saving the survivors (Thomasin Darling 30). Amongst all of these letters, however, there is no evidence that Grace ever received acknowledgement from the survivors of the Forfarshire’s wreck (Thomasin Darling). Grace attempted to reply to every letter and gift she received. She usually declined any admiration or gratitude, insisting that she was simply God’s instrument, and that therefore it was God who deserved the thanks. Many people wrote to Grace asking for a signature or lock of her hair, leading her to begin enclosing locks of hair in her responses as a means of repayment for the recognition she received (Thomasin Darling). This custom soon ended, however, as Grace “would soon have been left with a closely cropped head” had her attempts to satisfy the demanding public continued in this manner (Thomasin Darling 47). Despite this sudden burst of popularity and fame, Grace “shrank from, not courted, the public” (Thomasin Darling 38), behavior that simultaneously reinforced the Victorian conception of her virtuous nature and characterized her as a shy and wild creature threatened by the hungry public (Sitwell). Grace received many offers to be properly introduced to London’s society, some including paid appearances, but she refused all of them. The Duke of Northumberland, now a family friend and patron, understood Grace’s reluctance to embrace her fame and worked to spare her from undesired exhibition. When Grace received letters requesting her appearance at various ceremonies and functions, she informed the Duke and he wrote politely worded refusals on her behalf. Eventually, people began to write to the Duke in order to pass messages on to Grace. Grateful for this understanding and help, Grace called the Duke her Guardian and herself his servant (Thomasin Darling). The Duke was not able to shield Grace from the artistic community, however. The events of that September morning seized the artistic imagination of the era, and painters such as J.W. Carmichael and Thomas Musgrave Joy requested that Grace and her father sit for portraits. Many times, Grace would be forced to reenact awkward positions in order for the painters to properly portray the scene of the Forfarshire’s shipwreck. There were also many books dedicated to Grace’s story. Many of them were written as romances, with loose treatment of the facts of the event. William Wordsworth commemorated Grace and her actions in verse considered to be beautifully and poetically written, but also greatly romanticized and “embarrassing” (ODNB). Grace did not read or pay attention to any of the novels, in keeping with her strict upbringing (Thomasin Darling). She continued to “politely refuse” all offers of paid appearances (Correspondent) and to decline invitations to enter into London society, as Grace was content to focus on her chores and duties at Longstone and to remain a companion and helper to her parents. She refused numerous offers of marriage following her rise in fame (Bruce), and “clung to her father and to her name, [explaining] that any husband of hers should take it” (Thomasin Darling 11). She showed no indications of yearning for something more than what she had, and refuted the assumption that her quiet life on the island was unfulfilling, stating that she “[had] no time to spare” as she had “seven apartments in the house to keep in a state fit to be inspected every day by Gentlemen, so that [her] hands [were] kept very busy” (Mitford, 89 and 90). Despite the external clamor and demands of the public, Grace was satisfied with the quiet confinement, humble industry, and familial duty of the lighthouse. In this way, Grace lived contentedly at the Longstone Lighthouse until a sudden decline in her health occurred after a visit to her oldest brother on Coquet Island in 1842. In the hope of improving her condition, Grace’s parents sent her and her sister, Thomasin, to visit a family friend, George Shield, in Wooler (Thomasin Darling, Britain Unlimited). While there, Grace wrote to her parents that she greatly enjoyed spending time with her sister and was beginning to feel better. Thomasin’s letters contradicted Grace’s claim, however, as she wrote that her sister’s coughs remained about the same (Thomasin Darling). The two sisters then went to Alnwick, the residence of the Duke of Northumberland, as the Duke had requested that Grace be treated by his personal doctor. Grace’s health never improved, however, and the doctor said that her disease was one which “no skill, nor care, nor kindness could arrest” (Thomasin Darling 56). In one last attempt to save their daughter, the Darlings sent Grace to Thomasin’s home in Bamborough. Much to everyone’s surprise, Grace began to show signs of increasing health within the first few days in Bamborough. Despite this short-lived hope, Grace died several days later on October 20th, 1842 at the age of twenty-seven, a victim of what is believed to have been tuberculosis (Thomasin Darling, Britain Unlimited). She was buried in St. Aidan’s Churchyard, less than one hundred yards from where she had been born (Britain Unlimited). Though Grace was dead, her fame lived on in literature, art, popular culture, and, most significantly, the national consciousness. As Edith Sitwell put it, “to the last day of her life Grace Darling could not see that she had done anything extraordinary…but she became the pride of the nation” (Sitwell 62). Certain types of heroic legend coincided in her, as in the physical courage and prowess of Joan of Arc, the wild, indigenous innocence and rescue of Pocahontas or Walter Scott's heroines, and other romantic themes apart from love and marriage. In turn, she became a type recognized in other women's deeds around the world, even for predecessors such as the "Grace Darling of Newfoundland," Ann Harvey, who helped to rescue 180 survivors of a shipwreck in 1828 (Ann Harvey). To the Victorian Era, Grace stood as an emblem of both British courage and female virtue that resonated deeply with that era's imperialism and idealism. She was a woman with a truly “English heart” (Mitford) who represented the absolute best of her society, and gave its members hope and faith in a time of transition. Ann Harvey's Weblog , http://thedespatch.wordpress.com, 8 August 2009. Mitford, Jessica. Grace Had an English Heart. London: Penguin Books Ltd., Butler and Tannner Ltd., 1988. Sitwell, Edith, Dame. English Women. London: Prion, 1942. pp.59-63. A. Blagg, "Grace Darling." Britian Unlimited. A. Blagg's biographical entry about Grace Darling from the website Britian Unlimited. The webpage also includes images of monuments dedicated to Grace Darling from St. Aidan's Church in Bamburgh, where she is buried. Eva Hope, Grace Darling: Heroine of the Farne Islands, Her Life and Its Lessons. London: Walter Scott, 1875. [BiblioBazaar, 2008; Project Gutenberg eBook #23295]. Eva Hope's biography about Grace Darling, covering her domestic life as well as her role in the rescue of passengers from the shipwrecked steamer "Forfarshire." Considered to be a romanticized account of Grace's involvement in the rescue. In Chapter I, entitled "Woman's Work," Hope also records brief biographical sketches of Florence Nightingale and Elizabeth Fry. Preview of the text linked through Google Books, full-text eBook version linked through Project Gutenberg. The website of the Grace Darling Museum, part of the Royal National Lifeboat Institution Heritage Trust in Great Britian. The webpage includes "The Grace Darling Story" and other details about the museum dedicated to this heroine. The museum houses several artifacts from the rescue of the "Forfarshire." H. C. G. Matthew, "Darling, Grace Horsley (1815–1842)." Oxford Dictionary of National Biography. Ed. H. C. G. Matthew and Brian Harrison. Oxford: OUP, 2004. H. C. G. Matthew's Oxford Dictionary of National Biography entry on heroine Grace Darling, famed for her part in the rescue of passengers from the wrecked steamship, "Forfarshire." This concise biographical record includes a list of other sources and archive materials related to Grace Darling. Thomasin Darling, Grace Darling, Her True Story: From Unpublished Papers in Possession of Her Family. London: Hamilton, Adams & Co., 1880. Arranged by Grace's sister, Thomasin Darling, this account of the heroine's involvement in the rescue of the steamer, "Forfarshire," is based on testimonies from previously unpublished family records. Considered to be a more accurate account than the romantic treatment of Grace's actions in the national press. Full-text edition includes a portrait of Grace Darling. Linked through Google Books.